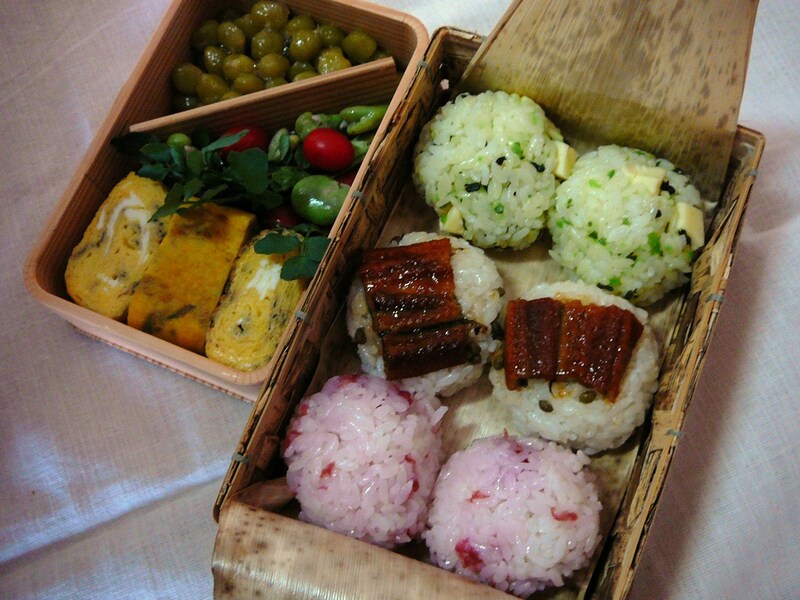 Today’s Lunch Box/Bento (’11/29): Sakura Anago Sushi Bento! The Missus was very busy this morning as she had to prepare not one but three bentos! She did have to come up with practical ideas, hence a sushi stylle! 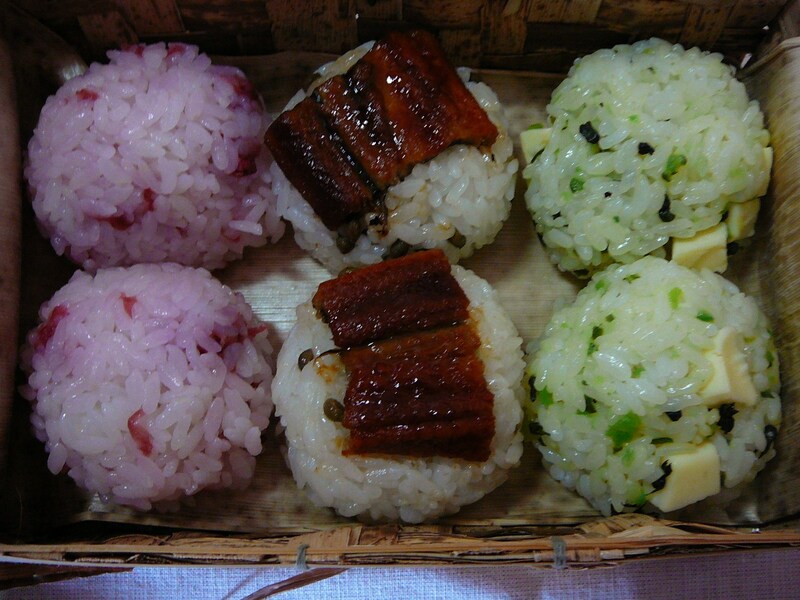 1-Sakura Te-mari: the rice was mixed with real pickled cherry blossoms. 2-Anago te-mari. She mixed the rice with home-pickled sansho/Japanese pepper seeds and topped them with broiled anago/conger eel. 3-Pickles and cheese te-mari. She mixed the rice with finely chopped Japanese cucumber pickles before introducing small pieces of processed cheese inside. 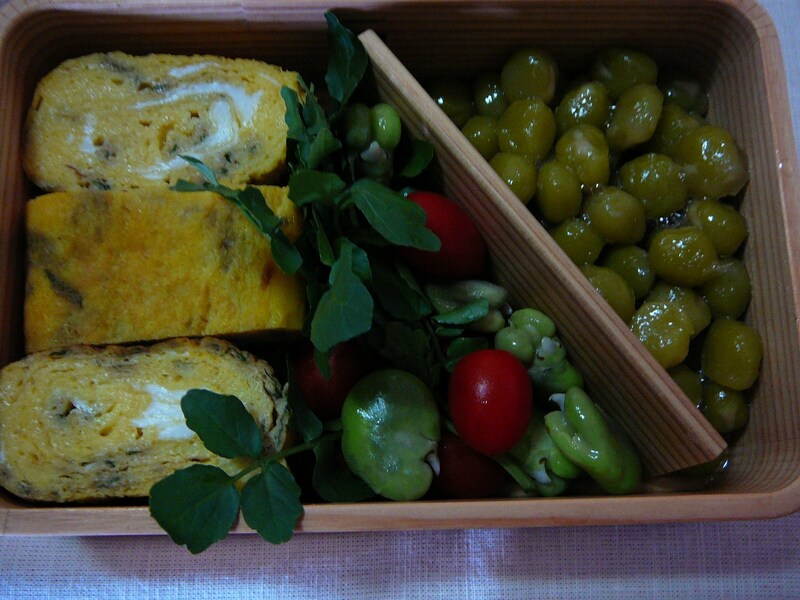 As for the side dish she prepared tamagoyaki/Japanese omelette with chopped shiso/perilla inside. She placed them in the box with shizuoka-grown cress and Ameera Rubbins pearl tomatoes and quite a few broad beans. For dessert she added sweet stewed beans. Thank you, Robert-Gilles for this answer. I have just read the post you linked to. Temari are so beautiful and apparently quite easy. I will do some training soon and will boast on my blog if I manage to make something presentable (and edible). I keep on admiring the beauty and inventiveness of all the bentos you are lucky to receive. Pickled cherry blossoms sound too beautiful and magic to be true. I have never heard about temari and thought onigiri was the name for rice shaped in any “handy” form… Are they also stuffed with anything? It will tell you a lot!